If you have not been to The Garden Table off Mass Ave in Indy, you should try it! 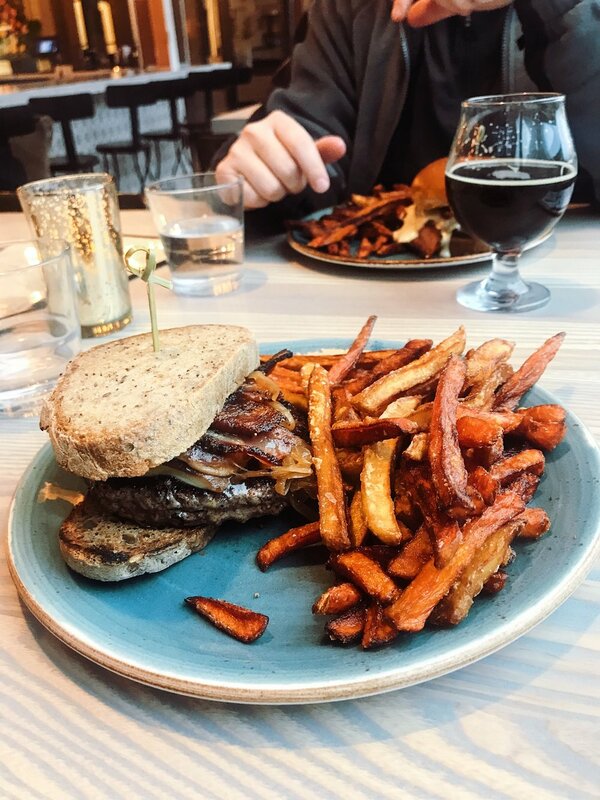 Pictured is a gluten-free burger with flash-fried carrots and parsnips! The saying is true, "You don't know what you've got until it's gone." How I miss macaroni and cheese: made with whole milk and real butter. Yes, I miss those tender loving carbs. As we approach the holiday season and recipes with staple ingredients such as butter, gluten, and sugar, I am reminded to focus on being thankful for what I can have, rather than what I cannot. Today, the diet has become less restrictive than when Topical Steroid Withdrawal began, but to most, it would still appear extreme. In a nutshell, I am avoiding gluten, dairy, eggs, soy, some nightshades (like potatoes), and some histamines. Before I began eating healthy, I thought that most who ate on such restrictive diets were doing it for the trend or because they were uppity rich health snobs. As I venture down the rabbit trail of learning and encountering the why behind avoiding certain foods, I find that the majority of those choosing these diets (that I meet at least) have severe health issues that require an alternative diet regime. Most don't just avoid one thing, but typically have two or three allergies or major food sensitivities. This makes dining at most American restaurants or carry-out centers practically impossible. I am extremely grateful for the season I have weathered to become a person with more compassion and understanding on this subject. It makes preparing recipes as a hostess a greater joy when I know that everyone on the guest list can participate, not just a select few. If we truly want to be people of empathy and understanding, we have to give up our comfort zone, selfishness, idleness and choose to engage. It means hanging our presumptions up on the wall and asking questions. For example, if someone in your office cannot have peanuts, do you make a point to offer an option of candy that is peanut-free? How can we be a good friend or co-worker if we don't take the time to listen and understand someone else's worldview? Yet, the other evening at a grocery store, a stranger picked up a box and said to her friend, "And we're getting this because we eat gluten and we are not...(something inaudible but in a rude tone)." The tone of her voice was hurtful and left me stunned. "How nice it must be to have the luxury of eating whatever you want," I thought. Yet I understand. Perhaps there's a co-worker or friend who makes her feel judged by her not eating healthy or avoiding gluten. Perhaps she's tired of feeling criticized by people who sound like airheads when they try to explain the why their diet is so special. Perhaps she's tired of the hypocrisy. Me too. Willful ignorance can be extremely hurtful, but there is an opportunity to engage if we have courage. This isn't about people being overly sensitive. It's about recognizing our blindness on a subject that causes pain to others because we don't look past ourselves. It's about embracing the diversity of people with backgrounds different from our own, even if they look just like us. It means seeing people as people with needs, with struggles and hurts, sometimes the latter being more severe than our personal problems. It means we need margin in our calendar for conversations. It means we must listen with full attention and past, "How is this relevant to me?" stage. If we truly want to love our neighbor as ourselves, it means putting the phone down and actually giving a crap.